The Quartzlock E10-MRX Sub-Miniature Atomic Clock (SMAC) is a low cost Rubidium Atomic Oscillator with 10MHz sine-wave 50 Ohm output and Accuracy of 5E-11. Operating from 12Vdc, in a miniature enclosure, measuring only 51 x 51 x 25mm this rubidium has all the performance needed for the internal referencing of a wide range of wired, wireless and instrumentation applications. 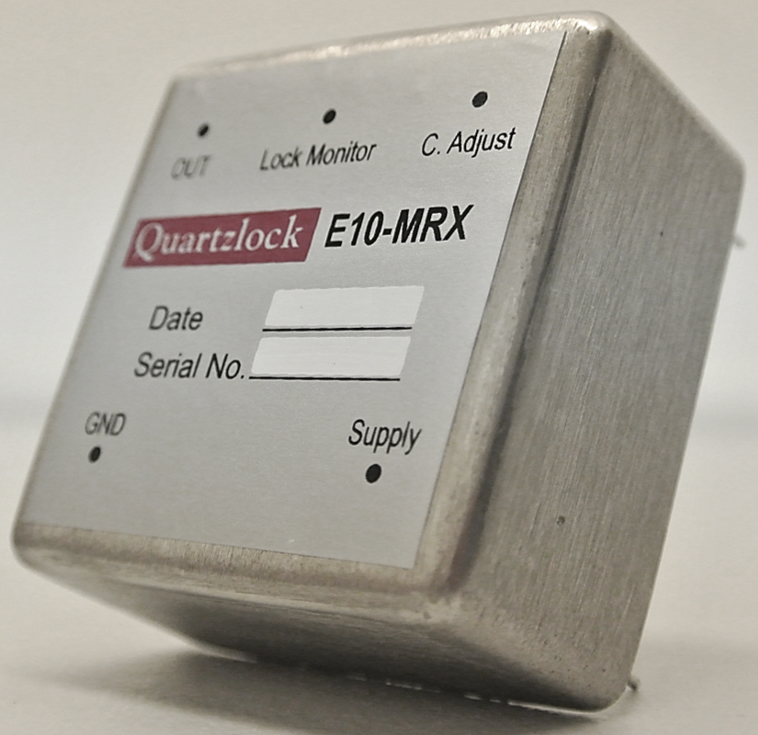 Quartzlock's SMAC technology far outperforms chip scale atomic clock devices with the E10-MRX far superior AVAR and phase noise. The E10-MRX is only <150g mass, and the smallest and lightest atomic clock with -95dBc/Hz Phase Noise and 8E-12/100s Stability. The power consumption is 6W at 12V dc / 500mA after 5min warm time. Volume is just 65cc. No antenna or view of sky is required as the E10-MRX is a completely independent atomic reference. Installation is completely simple….PCB mounted, all connections are via "OCXO" layout pins. The SMAC Rubidium oscillator is similar in cost to an OCXO; however the E10-MRX has 100 x better drift performance whilst maintaining the high frequency and time accuracy required for demanding applications. The outstanding performance, low power consumption and compact form factor make this rubidium oscillator suitable for telecoms, aviation, nautical and precision test and measurement environments as well as wireless base stations. The E10-MRX is a low cost, sub-miniature pcb mounted, rubidium oscillatior that maintains the high frequency & time accuracy required for demanding applications.